Paris: I’m Sorry, But I Just Don’t Get It! | From Europe and beyond. Paris: I’m Sorry, But I Just Don’t Get It! Paris is a City famous for love & art. A place where you will lose sense of time completely, leaving nothing but you and Paris. I’m sorry, but no. No, no, no! All the movies, songs, TV shows & even blog posts lied to me about Paris. One of my earliest memories of wanting to visit the City was when I watched the Mary-Kate and Ashley classic “Passport to Paris” as a kid. In true Mary-Kate and Ashley fashion, the girls jet off to an exotic location for a few weeks where they find adventure, hunky boys & friendship. When your young adolescent self watches these girls being whisked away for a double date all inclusive of views of the Eiffel Tower in the evening, it will become ingrained into your list of places that you absolutely must visit yourself. So what exactly did I not like about the City? Firstly, before I get a bunch of angry Parisians calling me out and getting offended. This is not aimed at all of you, just the people I met. For me, one of the best things about travelling is the people that you meet along the way, and Paris just didn’t give me good ones. When you’ve met a tonne of other French people who are wonderful, funny, caring & generally just the sort of people that you really do want to spend your time with, Paris is such a giant let down of all that you thought you knew. Parisians are like Londoners, however in less of a rush and a lot ruder. 2) It’s expensive as hell. 3) More on the people, what is with the harassment?! I’m not normally one of those people who feels uncomfortable walking around on her own, but in Paris I really think I would be. We all know that trick that when you’re travelling and someone puts a bracelet on your arm and says it’s a present, you need to take it off and hand it back immediately, because that is about to be the priciest present you have ever received. When this happened to me when I was walking along minding my own business in Paris, more men appeared out of nowhere and had me surrounded. I also didn’t have any cash on me at that moment in time and they weren’t taking no for an answer. If it wasn’t for a couple of guys from the group turning around and noticing what had happened before darting to my rescue then I don’t think that would be a very nice story to tell. Following on from this I later got surrounded by a group of young girls. At first it was hilarious before they started shoving me around in broad daylight and shouting at me in French. 4) You have to hold on to your stuff for dear life. To be fair, there are pickpockets everywhere that you travel. But I have never been warned so much about it in any European City as I was when I was in Paris. You will see that even the locals are holding onto their stuff just as tightly as you are. After living in Spain for a while it became a bit of a joke about how dangerously people would drive, but the Spanish have absolutely nothing on the Parisians. A green light indicating that you can now cross the road, doesn’t really mean that it’s going to be safe crossing said road as the driver’s will go whenever they please. The tight little roads that aren’t made for cars will even invite some of the driver’s down to test it out regardless of whether people are walking down it or not. In certain area’s there is a constant stream of traffic from all directions, the cars going whenever they want making it damn right impossible for any pedestrians, or even anyone in a car that doesn’t know how to drive as carelessly as they do. Get some more bins Paris. I’m clearly not the only one who was disappointed by Paris. In Japan they have coined something called “Paris syndrome”, for it’s inhabitants who have made a trip to Paris only to return home ill and shaken over the fact that the Paris that they have always dreamed of was absolutely nothing like they thought it would be. 8) That Paris is the capital of France. 9) Waiting, waiting & more waiting. You will be left waiting to order your food, coffee or to buy something in a shop for a very long time if you are clearly not French. Mentioned before, and quite a lot actually. But this really is the biggest killer of Paris, the attitudes are barbaric towards Tourists, and even French people themselves who come from outside of Paris. I really do think that if you’re going to another Country then you should get a couple of phrases from that country’s language under your belt so that you can attempt to converse in that person’s language. In every country I have done that in, I have found that people tend to be really pleased that you are making an effort, and that they in turn will make an effort to help you. But in Paris for doing this, I received dirty looks and snide remarks. Some day I will return to Paris and give it another chance. 13 responses to Paris: I’m Sorry, But I Just Don’t Get It! Some tips: The French are very proud of their language and of a certain politeness upon greeting strangers. Make sure to greet merchants with “Bonjour Monsieur” or “Bonjour Madame” before asking for what you want. Also be sure to say goodbye and thank you when leaving the store. “Merci, Madame. Au revoir.” That being said, I arrive by plane to Paris, party with friends, and go south as soon as possible. Coming from New York insanity, I don’t need Paris insanity. Once out of Paris, be sure to apply the rules of “politesse” wherever you go. Oh no that doe not sound too great! 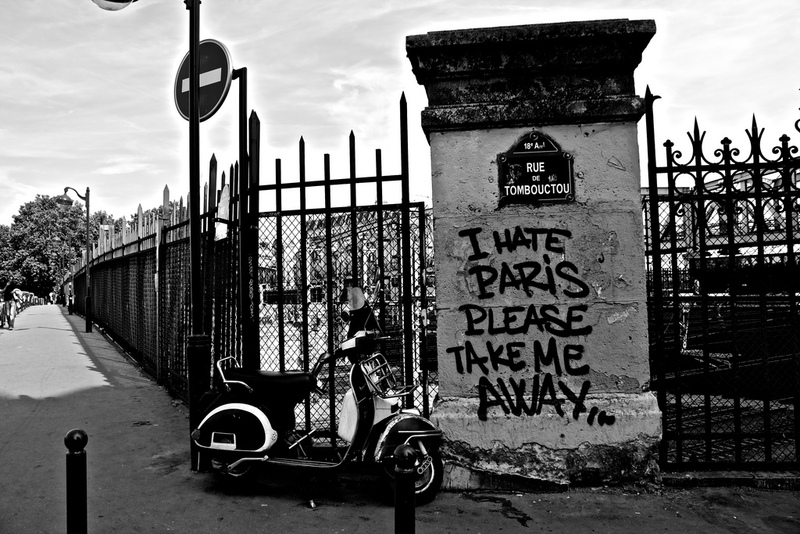 I believe Paris is one of the cities a lot of people start hating because so many others love it so much. In the end it is “just” a city, such as any else. I totally agree with you! This is exactly the same as what i felt about Paris when i was in Paris. I still dont get why some people think paris is the best city of the world. People there are unbelievably rude. So sorry to hear about your terrible time. We loved Paris the first time we went in fall of 2008 – we only had one rude-person encounter (a shop-girl who refused to get a jacket off the rack for me to try on) and one bad-tourist-trap story (Moulin Rouge). But when we went back in summer of 2014 with our kids, they seriously disliked it. They saw the dirt and the grime and the garbage and could not stand the urine smell of the metro. I know we’ll go back again, too much art and food and loveliness to ignore, but I’ll stick to shoulder-season. And, like a prior commenter mentioned, it *really* helps if you have a phrase or two of French and follow the greeting protocol! I agree 98% with your post. I found Paris way overrated. I realized though, the people genuinely don’t know how to speak English so it may come across as rude. There are a few nice people. The Champ D’Elysees was the only clean and pretty place I can remember. We travelled to other parts of France which made up for our shattered experience in Paris lol…I guess people out there should be warned about the illusion that surrounds the magical city of Paris.. This article is very appealing to individuals just like me. In case you follow this tactic, you must spin the wheel thirty seven situations, however you don’t place your money on guess during this time.